Not bad hey? I personally think it’s a winner. Allow me to give you some background into this wonderful piece of work you have just watched. In April this year Nic Paidas planted a seed. 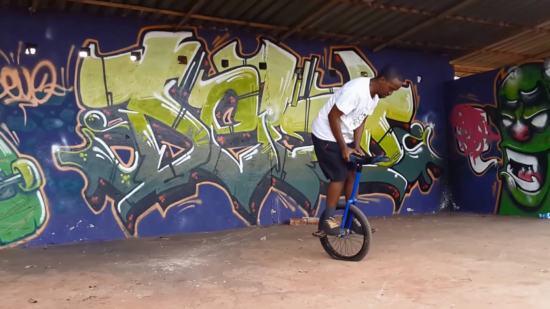 He had posed a question to the unicycling community via our Facebook group (Unicycling South Africa – AmaOneTya). He was looking for riders that were based in Joburg who would like to be apart of a short film he was making for the Cape Union Mart Adventure Film Challenge competition. He was specifically wanting to film mountain unicycling. Some days had passed when I got a call from Nic seeking some advice. He mentioned that he was thinking of doing his short film with Shaun Devenish as the rider. I could not have thought of a better person for this to happen to. Shaun is an strong Municyclist and is the catalyst as to why unicycling is in South Africa. That’s the short and sweet version at least but you can read the full background here. My answer to Nic was that it was a great idea as Shaun has not really been acknowledged for his role in our community. Some more time had passed and shoot day was upon Nic, Shaun and Chris Olsen (Nic’s friend who helped him shoot and do the interview). It was an early start for the guys as Nic was aiming for a sunrise shot or as we like to call it in the film industry, golden hour. It was a long day of shooting with drones, the type of short battery life and other camera gear. Shaun riding lines repeatedly for camera. He apparently bailed which resulted in a sore hand. I wonder if that was the bail we saw in the video? Then there was the interview which Shaun was very nervous about. Chris apparently put Shaun at ease during the Q & A session which resulted in what we see. Footage was in the can and Nic spent many an hour of his personal time editing the footage to some free music which had no copyrights on it. He sent the rough cut to myself and Shaun for viewing and advice. The video was great from an edit POV but the music needed work as it didn’t keep the viewer engaged for the stipulated 5 minute short film. Collectively we decided that the music needed to change. Being an alternative character and moving among people of a similar mind set I went about asking friends for help. Time was short as the competition deadline was in 5 days time. First I asked Hugo my Colombian friend who studied sound production… he declined due to the short deadline. Then I asked another DJ friend who also declined. Then I asked another friend who started the Afro Indie Pop band known as Native Young. Yannick Meyer graciously agreed that we could use my personal favourite song called ‘Kings’. I would highly recommend doing a search for their music. They are awesome!!! To make it slightly easier I will give you the link to ‘Kings – A Documentary about Native Young‘. Anyhoo, Nic did a bit of tweaking with the new music which became the final product which was submitted for the competition. I personally think Nic did a fantastic job based on all the constraints involved. It may not seem like it to you but making any form of video production has an enormous amount of things to think of and action to achieve, what we hope, will be a fantastic final product. I thought it wise to not only have my words fill this page about this video. Why not read something from the creator, rider and film assistant / interviewer. I just celebrated my 2 year uni-versary. Shaun Devenish was instrumental in my Uni learning experience as I’m sure he has been in many other people’s. I remember watching him ride terrain that I had trouble walking over! He was doing tricks that I had only ever seen done on videos. For years I’ve been watching short adventure films on a daily basis and often felt the urge to either star in one or make one myself. ‘Oddwheel’ the film in my eyes is far from perfect and not even close in being as epic as I imagined ! But it’s a step in the right direction and the passion for perfect and epic will burn and burn until I produce the next project which will take me once again one step closer to producing what I see in my minds eye. 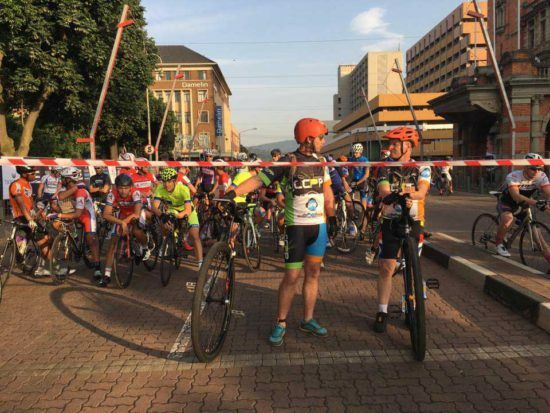 I’m really thrilled that Shaun’s story and skills are out there for the rest of South Africa to see and that mountain unicycling in SA is growing as a result of my involvement. There’s something inherently odd about watching the sunrise through the wheel of a unicycle. I should have expected it. Nic isn’t all that normal, and (as I came to realise throughout the day) Shaun isn’t either. They are both a rare breed of human who see something strange, like a unicycle, or making a unicycle clip, and instead of laughing it off with a shrug, proceed to delve into it with inhibitions abandoned. The light on the Strubens Valley hill was absolutely beautiful and made for exciting shots over the city and great swooping possibilities with the drone. Shaun fell a few times in ways that would make me go home immediately, but once again; not normal. After a sweaty walk back and cup of coffee we drove further into the hills of Krugersdorp to a campsite with a beautiful river (incidentally where I proposed to my wife). We were all frothing at the mouth at the possibilities of tyre splashes, extended lines and massive crags. I made sure that throughout the day I wasn’t getting too much personal information from Shaun so that in the interview I’d really be getting to know him with the rest of the Oddwheel audience. When first hearing from Nic about wanting to film me I was obviously rather excited, I never thought I’d see a film of me and my Muni entered into a competition. We arranged to meet super early on a Friday morning out in Roodepoort, much earlier than I’m used to, so when I got there I started to think “it’s still dark, how does this guy expect me to ride”. Soon Nic and Chris arrived and I found out the plan was to hike to the top of the mountain to get some sunrise shots, not too bad I just had to push my uni up, poor Chris had to lug the huge gyrocopter box up. When we got to the top there wasn’t a path at all, it was rather rocky and some stumps of grass, some scouting around I found a rocky ridge to ride and was able to make my own line. By around 7ish I had my first proper bail face first into some rocks, saved by the palm of my thumb which quickly became blue and swollen. After some more sunrise shots, just next to the koppie we were on, there was a path down the mountain, Nic wanted some Gyrocopter footage going down it. The grass either side of the path was quite overgrow, so I couldn’t quite see where I was going, I took another superman style bail, onto the same hand of course. If you look real close at the scene of me putting on my glove, you might notice it’s more like I’m trying to squeeze my swollen blue hand into it. The gyrocopter was interesting, at times quite intimidating; the sound it makes is comparable to a swarm of giant bees buzzing after you. I was surprised how quick the battery dies, so found myself riding down and jogging back a few times to try make the most of the air time. After a bit more filming it was time to head to the next location, but first a stop for some coffee and a bag of frozen peas, the only ice I could find for my hand… aahh, cold, what a relief. Over coffee we had a chat to explain the plan for the rest of the day & fill me in on what he had in mind for the layout of the film. We spent the rest of the day at the second location, a beautiful spot in Krugersdorp, it was also quite overgrown compared to the last time Nic and Chris had checked it out. It had some really nice sections to ride along the river, through and over it also. We ended the day off with a half hour interview, the thought of being questioned on camera was quite daunting for me, much more so than the riding, but soon got comfortable, forgot about the camera and felt like a normal conversation. Every scene of riding we shot was 3 or 4 takes so by the end of the day my body was sore and I was exhausted. Despite the injuries, I had loads of fun and we had planned to do some more filming. So I went scouting for some more filming spots, but before I knew it or could wiped the Muni mud out my eyes, it was near the end of June and Nic sent me a preview of the video for an opinion. Some last hour changes to the music kept me on my toes, anxiously waiting for the final release. I’m absolutely over the moon how it turned out, the response and comments I’ve been receiving has been more than I could ever have imagined. Huge thanks to Nic for his initiative in doing this. As beautiful and professional as this unique entry is, Nic placed 3rd. It’s an awesome placing but… yes, there is a but. Cape Union Mart had specific competition rules which Nic followed because he was serious about his entry. Remember I mentioned the final 5 days of this video’s final phase? Well, Cape Union Mart decided the day after the competition closed (when there weren’t enough entries) to extend the competition for another month. This allowed for more videos to be submitted. OddWheel would like to say congratulations to the winner Ziyaad Solomon for his video ‘Mowbray to Mowbray Ridge‘. Personally I wouldn’t have chose this video over Nic’s but it did have a great message – if you want to get fit it’s a simple as getting out there and running in whatever shoes and clothes you have. Super simple and uncomplicated. Everyone can connect to that, surely. What Nic created was a unique story about an equally unique sport! It’s like running on a wheel with super refined central balance.